ARLINGTON, VA; February 23, 2017 – For the 14th consecutive year, a nationwide study recently confirmed that PBS and its member stations are rated #1 in public trust among nationally known institutions. In addition, the same survey found that parents rank PBS KIDS as the #1 educational media brand for children, significantly outscoring cable and commercial broadcast television networks. The national poll was created by the research team at PBS and was conducted by telephone in January 2017 by Marketing & Research Resources Inc. (M&RR). Each year, PBS commissions research to measure its performance and value as judged by its most important stakeholder – the American people. PBS Ranks #1 in Public Trust – Significantly Outscoring Commercial Cable Television and Courts of Law Nearly 8 in 10 people trust PBS (76% “trust a great deal” or “trust somewhat”). The 2017 study marks the 14th time in a row that PBS was called the nation’s most-trusted institution among a consideration set that includes courts of law, commercial cable and broadcast television, newspapers, digital platforms and others. 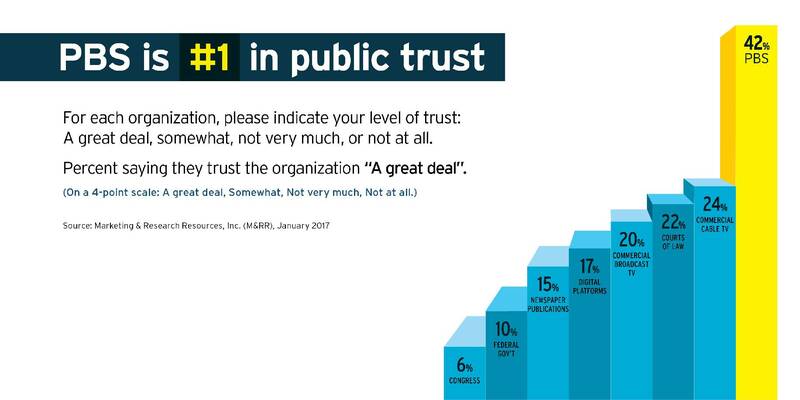 The study found that respondents had a significantly higher level of trust in PBS (42% “trust a great deal”) over the nearest institutions, including commercial cable television (24% “trust a great deal”) and courts of law (22% “trust a great deal”). PBS KIDS was ranked #1 as the most educational media brand compared to a range of other broadcast and cable networks. PBS is America’s largest classroom, biggest stage for the arts and a trusted window to the world. To learn more about how PBS and local member stations are trusted, valued and essential to communities across the country, visit ValuePBS.org. This survey was developed by PBS and conducted by phone, including landlines and cell phone-only homes within the United States, by Marketing & Research Resources Inc. (M&RR) on behalf of PBS from January 3-10, 2017, among 1,002 adults ages 18 and older. The sample included 484 men and 518 women. Survey results are weighted to be nationally representative of the U.S. adult population. For complete survey methodology, please contact Jennifer Rankin Byrne, PBS Corporate Communications, jrbyrne@pbs.org or 703-739-5487. Since 1989, M&RR has served businesses nationwide with comprehensive market research — vital to decision-making. Renowned within their industry, M&RR serves America’s major consumer product manufacturers, service companies and advertising agencies with research strategy and design, data collection, analysis and reporting. Each year, M&RR fields hundreds of telephone, mail and internet-based studies involving more than 1,000,000 respondents.